Before I dive in...I had lunch with reader Carol Baldwin and did a little Q&A. That interview is up on her blog now for those interested. Come on over and say hello when you're done here. We’ve got a bit of a theme week going, looking at a few “beyond the first draft” issues writers run into. Today, it’s keeping a character as interesting and compelling as we thought they were when we first created them. Characters often evolve as we write them, and it’s not uncommon to have a character we loved while we were planning a novel or writing that first draft feels a little, well, meh when we go back to revise. Now that we’ve seen them in action, we wonder why anyone would care about this person at all. Sometimes this is just us second guessing ourselves and the character is still good, but other times our instincts are right on target. The character is boring. We created them and even we don’t care anymore. Is it You or Them? It’s possible you’ve lost the love because you’ve been living with this character for a while, and what was new and exciting is now old hat. You know how their story plays out, you’ve figured out all the twists and secrets, and knowing that makes the character less mysterious and fun. What do you find interesting about the character? If you can’t answer this, it’s the character. There ought to be something about them that you find intriguing, otherwise they’re probably just walking around reading lines off a script like a bad actor. Try adding (or fleshing out) some interesting traits or aspects to this character. Make them someone you’d want to hang out with at a party, or spend time watching or talking with. What might other people find interesting about the character? Just because you find a particular trait intriguing doesn’t mean everyone will. It can be hard to be objective here, but if you’re feeling meh about a character and they feel like they ought to be more interesting, it’s possible their trait is a little too personal to you and you alone. Try developing a few more aspects of the character so they appeal to a slightly wider audience. Why is the character doing whatever it is the story needs them to do? If the only reason is because “plot tells them to” it’s the character (but it’s kinda your fault). They’re doing exactly what you asked them to, but you forgot to give them personal reasons to do it, so their actions have no meaning. This is fairly common in heavy plot-driven stories where the focus is on the problem or idea, not the characters. Try giving the character personal reasons to act in the story. Make sure they’d be doing this even if you weren’t there telling them what to do. Do you care about that problem? You might not care about the character because you no longer care about what they’re doing. This is hardly their fault, and it’s up to you to tweak the plot problem to something you and your readers would care about solving. Try looking at the core conflict of the story and rediscovering what you loved about this story in the first place. It’s possible the concept went a little off track, so now nothing feels that compelling. Are the story stakes personal to the character? If the character’s actions don’t affect them at all, or in such a minor way it doesn’t matter if they win or lose, why should anyone care about what they do? Having a solid problem is good, but it also needs to have serious consequences for the character if that problem isn’t resolved the right way. Try developing the stakes or making the stakes more personal to the character. Pinpoint exactly how the character’s life will change if they fail—and why that’s both good and bad. What positive traits does the character have? Readers like characters who are good at things and display likable qualities (even if they’re bad people). If the character doesn’t have enough skills or good traits, there might not be anything there to admire or care about. Try adding a few more skills or positive traits to round out the character’s personality. If you’re stuck, think about your favorite characters and why you love them. Maybe there’s a trait they have that can inspire you (just don’t copy them exactly). What negative traits does the character have? Characters who are too perfect are boring, and often annoying. Real people have issues and act badly sometimes, and a solid character should do the same. If your character has no bad habits or traits that hurt them in the story, that could indicate they’re not well-rounded enough to care about. A word of caution here—it’s easy to find “bad traits” that really aren’t that bad. “She’s a perfectionist” might sound like a negative trait, but how does that actually affect the story and hurt the character? Look for traits that cause the character problems or leads to them making bad decisions. Try adding some negative traits, or making existing traits affect the story and the character’s choices. What are the character’s flaws and weaknesses? Flaws differ from negative traits in that readers love characters for their flaws. Their flaws make them quirky, or charming, or more human and relatable because they feel so real. They’re also frequently a contradiction to the character, adding a layer of complexity to them. A lack of flaws, or a lack of real flaws (that perfectionist thing again) can make a character feel less than lovable. 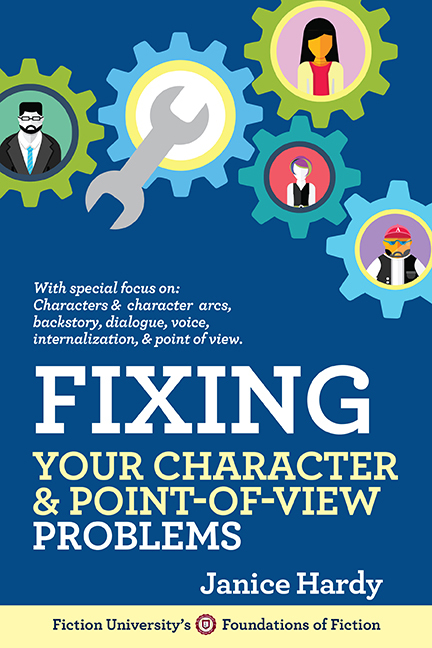 Try adding flaws that round out the character. This flaw is almost always connected in some way to the character arc, so if the interior conflict of the story is weak, there’s a good chance that’s what’s causing the character to feel weak. Fixing that arc will often fix the character. There’s always the chance that it is just you, especially if you’ve been working on the story for a long time or have gone trough a lot of rewriting during the first draft stage. It’s not uncommon for a writer to be so familiar with the work that nothing about it feels fresh anymore, and that includes the characters. If you’re feeling meh about the whole draft, that could indicate you just need a break from working on the book. Try taking some time off and forgetting about the story. Then go back and reread it, and see how you feel about the characters. If you feel they do indeed some work, start revising. If you make changes, make sure they’ll improve the novel, not just add new information that feels fresh—and thus “better” even if that’s not the case. Most writer-uncertainly issues can be solved by getting a beta reader to give you an objective opinion. Have someone who doesn’t know the story (or know it very well) read your draft and tell you what they think about your characters. If they love them, you know it’s just drafting cold feet and your characters are probably fine. If they have issues, your instincts were right and you’ll now have suggestions on where the characters need improvement. Characters are an important part of any story, so if you feel they’re not where they need to be, it never hurts to double check and make sure they’re people your readers will love. Have you ever lost the love for your characters between drafts? How did you deal with it? thanks for the shout-out, Janice, and for such a fine list of "is this what's wrong with your characters" (Help!!). Will save this post to think about as I write and revise. Good stuff! Anytime, thanks for having me over. Great post Janice. This is a keeper for the revising stage for sure. Another great post, with lots of links that invariably turn a quick read into an hour-long master class. I'll be putting your tips to use as I brainstorm a novella I need to write in a month (oy! ).